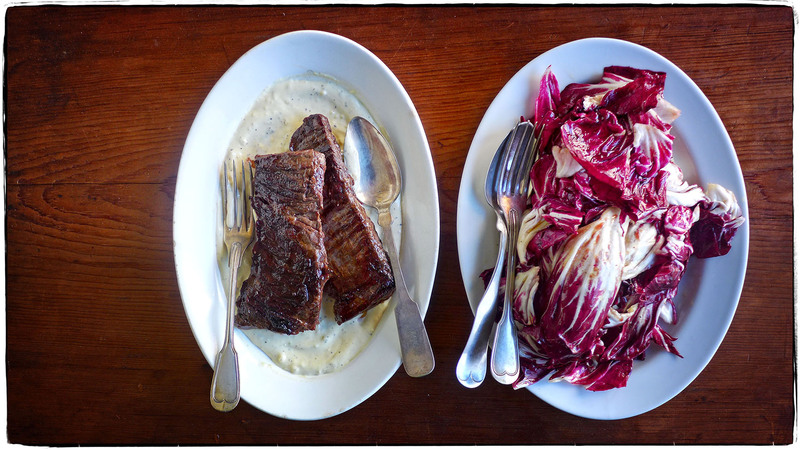 One would think the skirt steak tucked away in our freezer might have inspired our choice for lunch today, but it was actually the head of radicchio in our fridge. How delicious the bitter leaves would be tossed with a garlicky vinaigrette and served alongside the richness of a seared steak? Then we got to thinking that a “special sauce” of mayonnaise, sour cream, olive oil, and salt and pepper would taste awfully good with that seared steak. So we defrosted the steak and by lunchtime we were sitting down to a lovely little lunch accompanied by a couple of fingers of red wine to wash said deliciousness down. Get in the spirit of the season and remember to make something delicious for yourselves this weekend, dear friends.